a shiny white 7 feet wide and 50 feet long sidewalk. 1st shiny 7 feet wide and flat [target] cube is -13 feet behind and .02 feet above the sidewalk. it leans 90 degrees to the back. the ground is shiny white. 1st .7 feet tall rock is -1.8 feet behind and -7.3 feet right of and on the cube. 1st .35 feet tall orange garlic press is -.18 feet above the 1st rock. 2nd .7 feet tall rock is -25 feet behind and -5.5 feet right of the cube. it is -.07 feet above the sidewalk. 2nd .35 feet tall orange garlic press is -.18 feet above the 2nd rock. it leans 14 degrees to the front.it faces northeast. a 2.5 feet tall [peacock] chicken is 1.4 feet behind and 1.2 feet right of the 2nd rock.it faces northwest. a .3 feet tall wood garden rake is -2.3 feet behind and -1.9 feet left of the chicken. it faces northwest. it leans 30 degrees to the front. a .9 feet tall and 1.5 feet deep squirrel is -.26 feet above and -.8 feet in front of and -.57 feet right of the 2nd garlic press.it faces northwest. it leans 63 degrees to the front. 1st 50 feet tall and 6 inch wide blue flat tube is right of the sidewalk. it leans 90 degrees to the back. 2nd 50 feet tall and 6 inch wide blue flat tube is left of the sidewalk. it leans 90 degrees to the back. 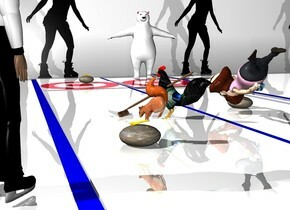 a polar bear is behind and .3 feet right of the cube. it faces the chicken. a 20 feet tall and 75 feet long [skating] wall is 4 feet behind and -9.9 feet above the bear. a referee is 1 feet in front of and 2.5 feet left of the 2nd rock. he faces northeast. 2nd shiny 7 feet wide flat [target] cube is 6 inches right of the 1st cube. it leans 90 degrees to the back. 3rd .7 feet tall rock is -19 feet behind and -3.5 feet left of the 2nd cube. it is -.07 feet above the ground. a man is -6.4 feet behind and -1 feet left of the 3rd rock. 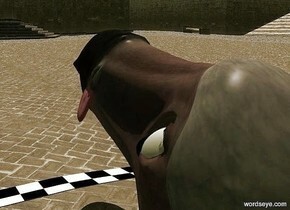 he faces back. he leans 45 degrees to the southwest. he is -.9 feet above the sidewalk. 3rd 50 feet tall and 6 inch wide flat blue tube is right of the 2nd cube. it leans 90 degrees to the back. The ground is ice. It is shiny. A small clear yellow sphere is on a huge flat shiny white sphere. The flat white sphere is leaning 90 degrees to the back. A small clear green sphere is -2 inch right of the yellow sphere. A small clear blue sphere is -2 inch above and 1 inch left of the sphere. A small clear red sphere is -2 inch above and -4 inch right of the green sphere. A small clear black sphere is -1.2 inch left of the sphere. A 4 inch high ice truck is 1 foot in front of the green sphere. It is facing the sphere. It is on the ground. A 2 inch high ice car is left of and 1.5 inch behind the truck. It is facing the yellow sphere. It is on the ground. A 1.8 inch high ice car is 2 inch in front of and 2.5 inch left of the car. It is facing the blue sphere. A 3 inch high ice truck is in front of the truck. It is facing the yellow sphere. A 2.5 inch high ice car is -1 inch behind and 1.5 inch left of the truck. It is facing the black sphere. It is on the ground. A 2 inch high man is 9 inch left of the car. He is facing the sphere. The azimuth of the sun is 270 degrees. Ambient light is black. The sun is silver. a 20 feet tall dodo. it leans 20 degrees to the back. it is -19.5 feet above the ground. a 200 feet deep an 15 feet wide and 0.01 feet high rectangle is -6 feet in front of the dodo. the rectangle has the [ziellinie] texture. the texture is 2.8 feet tall. the rectangle is above the ground. it is facing east. a 1 feet tall 1st white sphere is -4.8 feet right of and -11.1 feet in front of and -3.49 feet above the dodo. a 0.6 feet tall 2nd black sphere is -0.68 feet right of and -0.55 feet in front of and -0.79 feet above the 1st sphere. a 0.3 feet tall tongue is -4.8 feet right of and -8.3 feet in front of and -3.1 feet above the dodo. the tongue is facing east. the tongue leans 38 degrees to the front. the camera light is black. it is dawn. the sun's azimuth is 210 degrees. the sun's altitude is 70 degrees. a 20 feet wide and 100 feet tall [storm] tube leans 90 degrees to the front. it is -7 feet above the ground. a 6 feet long shiny sled is -20 feet in front of the tube. it is on the ground. 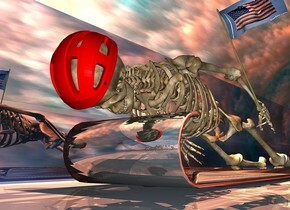 a 7 feet tall skeleton is -2.1 feet above and -7.2 feet behind the sled. it leans 80 degrees to the front. a .43 feet tall helmet is -1.85 feet above and -.62 feet in front of and -1.76 feet left of the skeleton. it leans 75 degrees to the front. a shiny flat wall is 200 feet long [scene].it is 3 feet tall and 70 feet long. it is 1 feet left of the sled. it faces right. the ground is 18 feet tall [snow]. the ground is 85 feet tall. the ground is 150 feet wide. 6 coral lights are above the skeleton. a tiny [flag] group is -2.6 feet in front of and -.32 feet right of and -1.77 feet above the skeleton. it leans right. a 5 foot tall shiny [texture] wheelchair is -10 feet above a 10 foot tall silver sphere. ambient light is beige. a crimson light is -1 foot above the wheelchair. a red orange light is to the right of the wheelchair. a mahogany light is to the left of the wheelchair. camera light is dim. 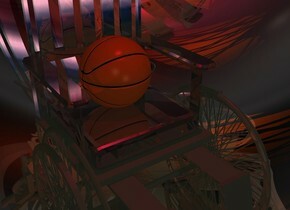 a basketball is on the wheelchair. a dim linen light is 3 feet in front of the basketball. a 50 feet tall 1st shiny rock. a 40 feet tall 2nd white rock is -30 feet in front of the 1st rock. a 60 feet tall 3rd white rock is -30 feet behind the 1st rock. a tiny 1st ball is 200 feet in front of the 2nd rock. a tiny second ball is 50 feet left of the 1st ball. a tiny 3rd ball is 80 feet right of the 1st ball. a tiny 4th ball is 200 feet right of the 1st ball. a 20 feet tall 1st dodo is -9 feet above and -58 feet left of and -45 feet in front of the 1st rock. it leans 15 degrees to the left. it is facing the 3rd ball. a 5 feet tall 1st laurel wreath is -3.9 feet above and -11.9 feet in front of and -15.5 feet left of the 1st dodo. it leans 110 degrees to the back. it is facing the 3rd ball. 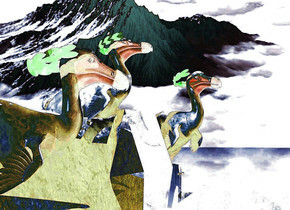 a 20 feet tall 2nd dodo is -13 feet above and -73 feet left of and -40 feet in front of the 1st rock. it is facing the 2nd ball. it leans 10 degrees to the front. a 5 feet tall 2nd laurel wreath is -4.9 feet above and -11.9 feet in front of and -10 feet left of the 2nd dodo. it leans 110 degrees to the back. it is facing the 2nd ball. a 20 feet tall 3rd dodo is -16 feet above and -40 feet left of and -40 feet in front of the 1st rock. it leans 20 degrees to the front. it is facing the 4th ball. a 5 feet tall 3rd laurel wreath is -7.6 feet above and -12.9 feet in front of and -17.5 feet left of the 3rd dodo. it leans 110 degrees to the back. it is facing the 4th ball. 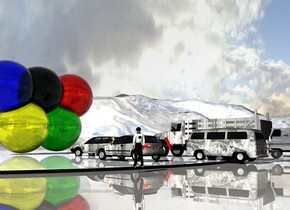 the [olymp] image is on the sky. the image is 3000 feet wide. the ground is shiny. the camera light is black. it is dusk. a white light is 5 feet in front of and 20 feet above the 2nd dodo. a 50 feet tall shiny [snow] trumpet leans 90 degrees to the right. a red marble is -26 feet behind and -22.4 feet above and -35 feet left of the trumpet. 10 sky blue lights are left of the marble. 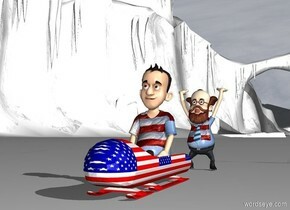 a [america] sled is -1.8 feet above and 5.7 feet left of the marble. it faces northeast. it leans 50 degrees to the right. 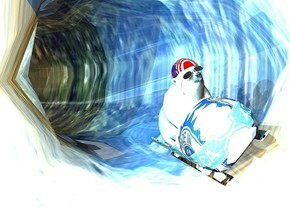 a 1.5 feet tall polar bear is -3.1 feet in front of and -2 feet above and -2.6 feet left of the sled. it faces northeast. it leans 45 degrees to the northeast. a .12 feet tall black headwear is -1.05 feet above and -2.17 feet in front of and -2.46 feet left of the bear. the frame of the headwear is white. the headwear faces northeast. it leans 45 degrees to the northeast. a .3 feet tall bicycle helmet is 3 inch tall [flag]. it is -.9 feet above and -2 feet in front of and -2.3 feet left of the bear. it faces northeast. it leans 33 degrees to the northeast. the runner of the sled is silver. a orange light is -2 feet above the sled. the camera light is 20% rust. Go for the gold , Timothy! a sled.a 1st small man is -10 inches above the sled.the sled is flag.the 1st man's shirt is flag.the ground is snow.a 2nd small man is 2 feet behind the sled.the 2nd man's fat shirt is flag.the sky is leaning south.it is morning.